Just booked your first African safari? You may have realized that there are a series of considerations when it comes to clothing, but don’t panic if you end up with information overload from Google. 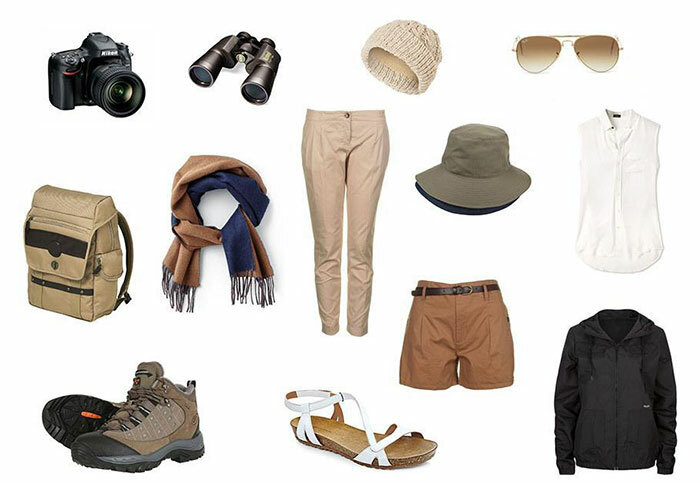 Try not to over-think safari gear – there is no need to blow thousands of dollars on traditional khaki gear. It is better to blend in than stand out, so neutral toned clothing is best – think beige, brown, muted greens, and anything on this spectrum. 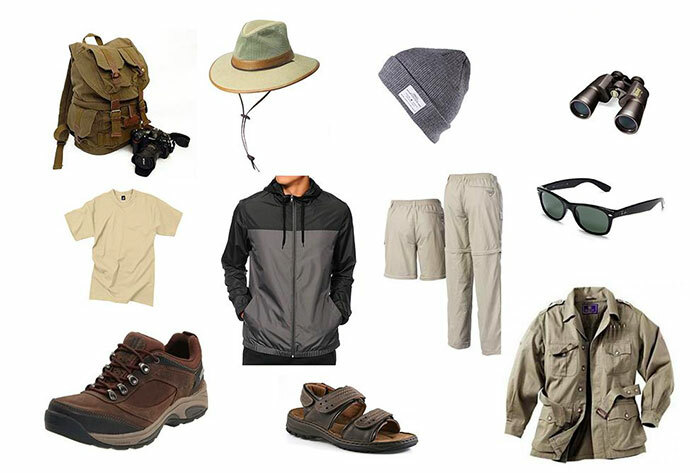 We’ve put together a one-stop guide on packing for your safari, with information on material, weather considerations, area traits, and some useful packing tips. If you feel like you are ready to jump right in and look at selections available, we recommend the extensive collection of safari clothing available at Amazon. You may see safari clothing advertised on online stores with all kinds of special additions, from embedded insect repellent to individual vents – these tend to be overpriced and are not necessary. Comfortable clothes that you can layer are the best – cotton, lightweight shirts, fleece jackets, sandals and closed walking shoes. Long trousers that zip off at the knee are good options, and will also reduce your packing load. It’s reasonably necessary to pack lightly – most safari lodges and camps offer a laundry service, so there is no need to bring a different shirt for every day of your trip. It’s inadvisable to bring expensive clothing – you’re likely to get a little dirty or dusty when exploring reserves in open-sided vehicles, so don’t carry any clothing you’d be devastated to lose or mess up. For women, dresses are ok for evenings at the camp; however, if you’re in an area that has strong mosquito presence, it’s advisable to wear long pants to keep your legs protected. Don’t fall into the trap of thinking Africa is hot 24/7. Early mornings and nights can be much chillier than you may expect, so remember to bring something warm to keep cozy during the early hours and late evenings. Warm pajamas are a must. Safari vehicles are either completely open or have open sides with a roof, so chilly breezes will happen. Bring a windbreaker to help with the wind chill, and a beanie and gloves can be lifesavers on early morning safaris. It’s essential to layer when on safari – temperatures will range from hot during the day to chilly at night, so you’ll want fabrics that breathe during the day and ones that keep you toasty at night. A good windbreaker and fleece are great for staving off cold winds during a safari, while lightweight t-shirts and shorts will suffice during the day. It may be tempting to go for traditional cotton, but you’ll sweat. It’ll pay off to buy breathable synthetic clothing, especially types designed to keep you cool in high temps. Color can depend on where you’re heading for safari. For the most part, stick to neutral shades – beige, brown and muted greens. These will help you blend into your surroundings, especially while walking. White is ok when in vehicles, but not during walking safaris. The same goes for black – stark colors will make you stand out when you’re walking in the bush, potentially attracting unwanted attention from dangerous animals. There are also specific areas that warrant other restrictions – for example, some areas of Tanzania, Kenya and Zambia are home to tsetse flies. Tsetse flies carry human sleeping sickness, and while most flys are not infected, their bite can be extremely painful. Avoid black and blue clothing as the flies are attracted to these colors, and make sure you wear closed shoes and take insect repellent with you. Also, make sure to wear long pants and long-sleeved shirts during the day when out on safari. Wooded areas and water sources like river banks are home to Tsetse flies – you’ll be unlikely to find them out on the Serengeti plains and Masai Mara. The Amboseli is also mostly free of the pests. It can be worthwhile to pack in a pair of gloves (fingerless or full) and a beanie (knitted hat), especially if you tend to be susceptible to cold temps. Since vehicles are open, early-morning cold winds will make the ride uncomfortable unless you cover up sufficiently. Scarves can also be great for keeping the chill at bay and double as a camera cover to keep the dust off your gear. Sun hats (preferably with chin straps) and sunglasses are also important! Where are you going and what type of safari are you doing? Different regions have different features when it comes to wildlife and environment, as well as safari type, and will guide your packing. If you are heading to Zambia, it’s highly likely you’ll be doing walking safaris. So keep in mind that you’ll need comfortable, durable walking shoes, a sun-hat and avoid white and black clothing. If you are doing boating safaris – e.g., the Zambezi and Okavango (Botswana) – you should take a good waterproof windbreaker and prepare for frigid nighttime temperatures. The dry season in Kruger sees far fewer mosquitoes, so women can comfortably pack in dresses for evenings at camp, and worry less about being bitten when out on safari. If you’re safari-ing close to Cape Town, the Eastern Cape, Pilanesberg or Madikwe, you don’t need to worry about packing malaria medication – these areas are all outside of the malaria belt. Climate Considerations – when are you traveling? If you’re heading to South Africa, remember that climate varies significantly between the Western Cape and the greater Kruger region. The Western Cape has a Mediterranean climate and sees warm, dry summers and cold, wet winters. In contrast, the Kruger and Pilanesberg areas have subtropical temps, with summer rainfall and dry winters. The area tends to keep similar daytime temps (around 25°C) year round. If you’re going on safari in Sanbona (approximately 3 hours from Cape Town), you’ll experience cold days (with occasional rain) from June to September and hot, dry days between October and April. Also bear in mind that if you are traveling to South Africa, and going from Cape Town to Kruger for a safari, you may experience vastly different temperatures in each region. Pack for both ends of the spectrum. If you’re heading to East Africa, expect steady daytime temperatures in the high 20s (Celsius) year round. At night it can be cooler, dropping into the teens. Rainy seasons in Kenya and Tanzania are from November to January and March to May, with some regional variations. If you’re traveling in these time frames, pack a raincoat! In general, be prepared in areas like Botswana, Zambia, and Kruger for a couple of days that soar up to 40°C if you’re traveling in summer. Summer months, or heat waves, is where that synthetic, breathable fabric will come in handy. *Minimum temperatures in Zambia can drop as low as 5°C. NB! Weather in Africa has become increasingly unpredictable, so even taking patterns into account, you should always be prepared for anything. Pack that raincoat just in case. Many camps have laundry facilities, and you can have all your clothes washed. Keep in mind though, that most, if not all, will also iron clothing. The ironing services have a practical purpose, as “Putsi” flies like to lay eggs in damp clothing – ironing kills eggs. If you have any delicate clothing that would be burned or damaged by pressing, be sure to let the staff at your camp know. Most people also prefer to wash their undergarments, so it can be handy to bring along some liquid handwashing soap for this purpose. Jeans are not ideal – they can be too warm during the day, and take longer to dry if you are doing laundry – camps will not have drying machines. Don’t pack high heeled or wedged shoes, you won’t be needing them, and they’re highly unpractical in a bush situation. When it comes to shoe packing, comfort and durability are what you want. If you are crossing borders on your trip, don’t wear camouflage! Camo clothing tends to draw unwanted attention at border crossings. Leave expensive jewelry and watches at home. They’re out of place in the bush, and if left unattended in rooms or tents, they can fall prey to monkeys, who are partial to stealing shiny objects. Luxury camps are safari lodges are mostly very casual. There’s no need to bring evening wear, although you certainly can wear “nicer” clothing than you would on safari. Keep everything comfortable and stick to the policy of avoiding bright colors. Remember to layer! If you are flying between camps/reserves, you will need to keep in mind luggage restrictions. Small aircraft usually have a baggage limit of around 20-30lbs, so remember to pack light. It may be better to bring a light duffel bag rather than a wheeled suitcase, and this will also force you to keep the contents of your bag to the essentials. Many camps have full bathroom amenities, but not all. Check with your camp if they stock shampoo and soap etc. Bring along travel sized shampoos/conditioners, toothpaste, and other cosmetic products. Don’t forget the insect repellent! Camps will carry first aid kits, but there’s no harm in bringing a couple of small things with you. A good antibacterial cream like Bactroban, some disinfectant and band-aids are always useful, and if you don’t need them, chances are someone else in the camp might. Can you take kids on safari?